The cemetery was formed as a burial ground for Union guards from the Rock Island Prison Barracks, and "galvanized Yankees" (Confederate prisoners who opted to take the Oath of Allegiance to the Union and serve as Union soldiers rather than return to the South). It was originally located farther west on Rodman Avenue, in a spot that is now part of the Arsenal Golf Course, across the street from Memorial Park. It was moved to its current location, on the east end of Arsenal Island, at the request of General Thomas Rodman, the second commander of the Arsenal. At the time of the move, several soldiers were also moved from Oakdale Cemetery in Davenport to the new National Cemetery. It adjoined the Arsenal Post Cemetery, which has now been absorbed as part of the National Cemetery. At least some graves were also moved at this time from the old Fort Armstrong Post Cemetery. 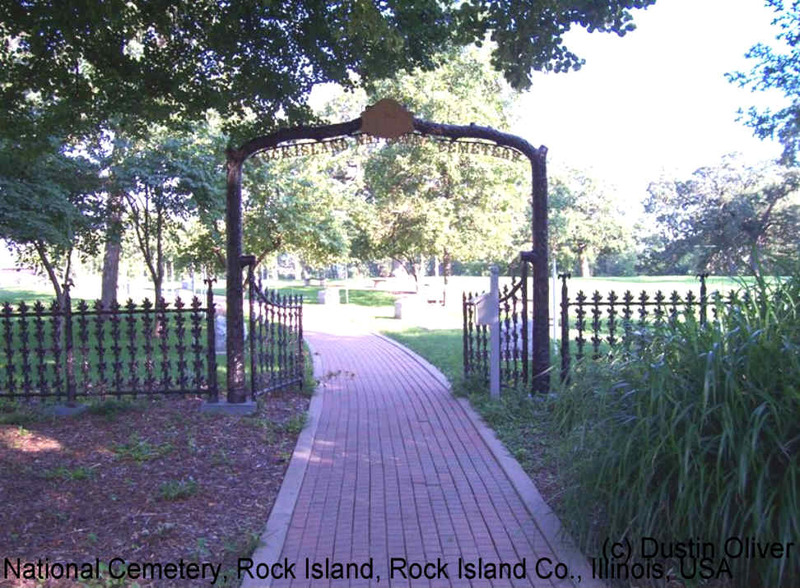 To reach the cemetery, enter the Rock Island Arsenal from either the Davenport or Rock Island gates (the Moline Gate is closed for the forseeable future). From the Davenport gate, head east on Rodman Avenue for several miles, passing the Arsenal buildings, as well as the Confederate Cemetery. The National Cemetery is on the right hand side of Rodman Avenue, near the Moline Gate. If entering by the Moline Gate, the cemetery is almost immediately on the left hand side of Rodman Avenue, just past a golf driving range. Please be advised that the Rock Island National Cemetery is located on a federal military installation, with requisite security. All vehicles are subject to search while on the island. Visitors over the age of 16 must provide photo identification at the entrance gates and be issued a visitor pass for their vehicle. If you plan to visit any other attractions on the island (such as the Arsenal Museum, the Davenport House, or Lock & Dam 15), be sure to inform the sentry, so that all locations can be added to the visitor pass. The original gate along with part of the original fence, which were both cast by Arsenal workers from recycled Civil War artillery. The path is the Memorial Walk, leading to the gravesites of two former commanders of the Arsenal in the original Arsenal Post Cemetery.